Whether I like it or not, the market is a game of sheep, especially during times of uncertainty. And because of the weaker jobs data, we are in a time of uncertainty. The majority of players will stick with the conventional thought, until told to think other wise. (Data or some really big fish influencers will change their thought process.) Until then, too much money controlling this market falsely rely on price action as a fundamental tool. The problem with price action is that there is an inherit assumption that the market is always efficient, but everyone knows thats not the case. Its the whole premise of "buy high, sell higher". 2. More importantly, the Average Weekly Earnings increase from last week to $806.61. (IMO, this better reflects the overall income availability for the economy. I was really concerned by last month's big decline, and the increase is something I wanted to see. 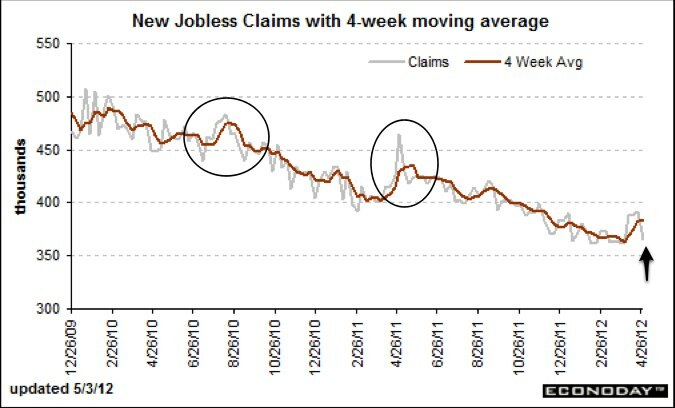 Looking past one number, the jobless claim trend is already starting to brush off its seasonality. 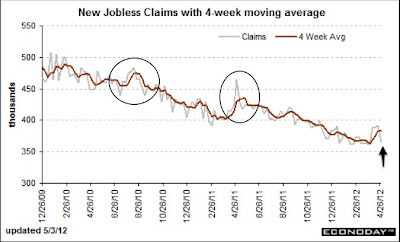 The current information we have from jobs data suggest this hiccup is already starting to pass. Regardless of the above trend, the sheep are looking at the 10yr yield, and the decline in the yield is what is guiding their market thesis. A contributing factor to negativity was the price of oil. Oil's decline probably spooked some players as well, even though some of Friday's decline was most likely attributed to margin increases to pure speculators. Despite the current progress within Europe, the most important indicator I have been paying attention to in Europe is the Euro-to-manufacturing PMI correlation. With a lower Euro, the EU will see an improved PMI, and the economy will begin to grow again. The peripheries are very much in need of this. They needed it yesterday. The Euro currently looks like it wants to break down from its current 129 support. If it can break, the next stop is 126. From a global GDP perspective, this is good. The SP500 is sitting on support levels, and given the continued earnings strength many stocks look really really interesting here. From a momentum perspective, traders will most likely continue to take their cues from market indicators like Oil and the 10yr yield. However, imo, all market player are being reactive to the jobs data, and whether anyone cares to admit it, the trends suggest the Jobs data is coming out of its hiccup. 1. Financials - Some financials are 6-10% from book value. IMO, this is a buying opportunity. Not for normalized earnings. Normalized earnings will not be clear until the 10yr yield increases above 3%. The current play on financials is to purchase below book value. The US housing and MBS market has improved so much that the US bank values merit book value valuation. Once yields improve, then they will be measured by normalized earnings.